Italian oil company Eni led the charge back into Libya on Monday as rebels swept into capital Tripoli, hailing the end of Muammar Gaddafi's rule and warning Russian and Chinese firms of contract revisions. Gaddafi's fall will reopen the doors to the country with Africa's largest oil reserves. New players such as Qatar's national oil company and trading house Vitol are set to compete with established European and U.S. majors. "We don't have a problem with western countries like Italians, French and UK companies. But we may have some political issues with Russia, China and Brazil," Abdeljalil Mayouf, information manager at Libyan rebel oil firm AGOCO, told Reuters. The comment signals the potential for a major setback for Russia, China and Brazil, which opposed tough sanctions on Gaddafi or pressed for more talks, and could mean a loss of billions of dollars worth of oil exploration and construction contracts in the African nation. Shares in European firms -- Eni, Austria's OMV and France's Total -- rose by 3-5 per cent, despite a modest fall in the price of oil, on hopes the firms would be able to quickly re-establish output from Libya. Italy's Foreign Minister Franco Frattini said staff from Eni, top producer in pre-war Libya, had arrived to look into a restart of oil facilities in the country's east as fighting between government troops and the rebels continued in Tripoli in the west. "The facilities had been made by Italians, by (oilfield services group) Saipem, and therefore it is clear that Eni will play a No. 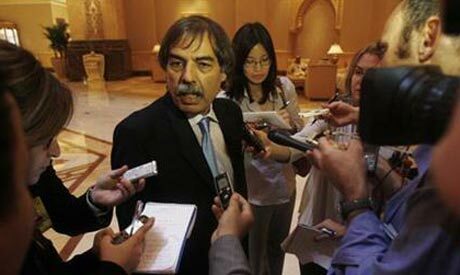 1 role in the future," Frattini told state TV RAI. Before the war, OPEC member Libya produced about 2 per cent of global oil output or 1.6 million barrels per day, and it has reserves to sustain that levels of production for 80 years. A Reuters poll forecast it would take up to a year to restore Libyan output to at least 1 million bpd and up to two years to get back to pre-war levels. "It will be some time before Libyan oil production resumes ... However, the prospect of resumed output from Libya will remove some of the political risk premium in the oil price," said Caroline Bain at the Economist Intelligence Unit. AGOCO said that it was technically ready to start oil output in its two eastern fields, with capacity of 250,000 bpd. "We have taken care of the maintenance. We have Libyan oil companies and can start anytime if security is approved. We can start without the foreign companies," said Abdeljalil Mayouf, information manager at AGOCO. He added that security forces hired from the former Libyan army were already present at the fields and the firm was waiting for their clearance to start production. About 75 Chinese companies operated in Libya before the war, involving about 36,000 staff and 50 projects, according to Chinese media. Russian companies, including oil firms Gazprom Neft and Tatneft, also had projects worth billions of dollars in Libya. Brazilian firms such as Petrobras and construction giant Odebrecht were also in business there. Apart from Italian officials, other European politicians and oil companies were more reserved in comments on Libya. "We are observing the current situation and further developments very closely. At the moment we are not holding any bilateral talks with the (National) Transitional Council," a spokesman for Austria's OMV said. Other major player in pre-war Libya France's Total and Germany's Wintershall declined comment. Analysts and industry observers have said Eni and Total could emerge as the big winners in post-war Libya due to their countries' heavy support for the rebels. Big support from Qatar as well as oil trader Vitol, neither producers in Libya before the war, may also guarantee a chunk of reserves and influence goes to new players. "Qatar will be a big player. Vitol might be an important one. Shell is also looking to boost its role," said a Western risk consultant with knowledge of negotiations. Shell and Vitol declined to comment. Most global oil majors have taken a much more cautious approach to events in Libya. BP said it was planning to return to explore but gave no timeframe. "We fully intend to return to Libya to fulfil our contract when conditions allow," said a spokesman for BP, which did not have production in Libya before the war. U.S. companies such as Marathon, ConocoPhillips, Hess, Occidental pulled out of Libya at the start of the year and have had little direct involvement in the events there since then. "They are just sitting and waiting and trying to figure out who will run the place," said the risk consultant who is advising some U.S. firms on Libya.